GRANTS PASS, Ore. (AP) — The Gold Rush of the 1850s helped settle Oregon, enticing sailors to jump ship and farmers to take a detour from the Oregon Trail. 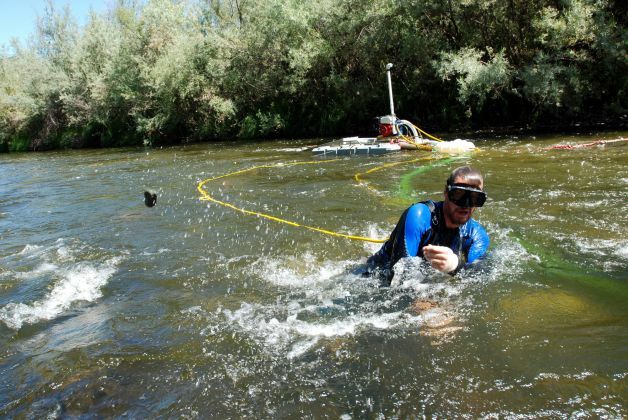 More than a century later, some state lawmakers want to clamp down harder on modern gold-mining gear known as suction dredges in salmon streams, particularly in southwestern Oregon, where the Gold Rush first struck. Powered by gasoline engines, suction dredges act like a big vacuum cleaner, sucking gravel off the river bottom and settling out the gold. Suction dredging permits have doubled from 934 in 2009 to 1,941 in 2012, according to the state Department of Environmental Quality. Sen. Alan Bates, D-Medford, said the idea has been rattling around the Legislature for years, but he became concerned when the number of dredge permits started to approach 2,000. "What we want to do is not have dredging in sensitive waters for salmon and steelhead rearing," Bates said. Just what form restrictions would take is under discussion. Bates said an expansion of rivers protected under the Oregon Scenic Waterways Act is one likely method, since the act prohibits mining in protected rivers. Another could be a moratorium like the one adopted by California in 2009, which sent some miners across the border into Oregon. "When it comes out, hopefully there will be something to protect the rivers and allow some mining yet in areas we think are safe," Bates said. "We need to get the science right, and we're still gathering that." Oregon protects 19 segments of rivers as scenic waterways, including parts of the Rogue, Illinois and Klamath rivers, which have long been mined for gold. One bill, SB401, proposes expanding the scenic waterways list by 31 rivers, including 13 in southwestern Oregon. Among them is Josephine Creek near Kerby, where the discovery of gold in 1851 set off the Oregon end of the Gold Rush. Another bill, SB115, would prohibit placer mining statewide, leaving open recreational mining with a small dredge. A third, SB370, would require gold dredgers to pay $125 for a commercial placer mining permit, and restrict them to small dredges with hoses less than 4 inches in diameter. Violations would be a misdemeanor punishable by 30 days in jail and a fine of $1,250. The proposals have outraged gold miners, scores of whom rallied on the Capitol steps last week in Salem. "You have the state now trying to pass a law that would prohibit mining on your mining claim (on federal land), which is a taking," said Tom Kitchar, president of the Waldo Mining District outside Grants Pass, who spoke at the rally. "There are numerous court cases that say the states and local governments cannot subvert the federal law. "As far as I'm concerned, the environmentalists are parasites on society. They produce absolutely nothing," he added. "If (all the bills) passed, we probably wouldn't be able to do anything anywhere. Gold mining has been going on for 5,000 years. You are not going to stop it. They can pass all the laws they want, they are still going to mine. Especially on federal lands." Salmon advocates have been tightening the screws on gold mining in rivers for decades, citing research that it releases toxic mercury into the water, alters the structure of river bottoms, and produces silt that chokes spawning gravels. They have had trouble getting new federal river protections through Congress. "Southwestern Oregon is where we are seeing the most destructive suction dredging activity," said Erik Fernandez of the conservation group Oregon Wild. "It goes back to the heart of this issue being clean water." Oregon already prohibits suction dredging when salmon and steelhead lay their eggs in the river gravel. The state also sets limits on how much muddy water dredges can produce.